A nice picture of cat flea dirt. 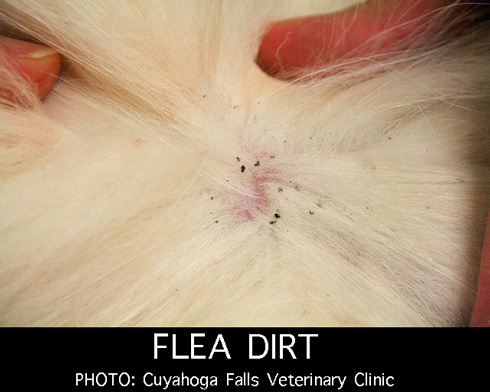 For cat caretakers who might not be sure what they are looking for when checking for evidence of fleas on their cat (or dog for that matter) should have a look at this picture provided by Cuyahoga Falls Veterinary Clinic. This photo has been used with permission for teaching/educational purposes at Pictures of Cats dot org. Thank you. If you would like to use it please ask the people at the clinic first. Cat flea dirt is flea feces. You often see it at the rear end of the cat at the base of the cat’s tail. If you pass a, 32 teeth to the inch, flea comb through that area you will pick some up if your cat has fleas. You might also pick up some fleas but fleas tend to live at the other end of the cat (shoulders, neck, head, chin, throat). You might also see flea eggs which are referred to as “salt” in the combination of salt and pepper (pepper being the feces). They are light coloured. Cat flea feces is made up of blood. So when you comb it out and sprinkle it onto a white, hard surface and wipe it with a damp paper towel it streaks deep red/brown. So look for the (1) Flea (2) Flea feces (3) flea eggs in a cat’s coat. Of these three, the easiest to see is the flea as it moves! And jumps and runs away….ghastly things. See also what do fleas look like? and flea treatments can kill.